Nowadays, it is quite impossible to find a decent place to eat in Orchard Road. The cost of a meal in a food court in town is easily at least SGD$4-6. So when my friends told me about this famous chicken rice stall at Far East Plaza which serves relatively-affordable and good chicken rice, I decided to go there for lunch to see what’s the hype about. Hainanese Delicacy Chicken Rice is located on level five of Far East Plaza, just a five minutes walk from the main shopping belt. The run down coffee shop has several tables within a long narrow space; there’s always a queue throughout the day – a testimony of their popularity. So is the chicken rice really that good? Is it worth queuing up for? Let’s find out. In addition to chicken rice, the shop also has the usual side dishes like boiled soup, and vegetables. We skipped the sides and went straight for the chicken. The rice is nice and fragrant, and most importantly, not too oily. If you don’t like chicken rice because it is too oily, this will most likely change your impression. I found that their chill sauce was very well-balanced; not too spicy, not too mild. The chicken, too, was tasty. But somehow, I wasn’t blown away by it. I mean, the chicken rice that we had was definitely better than average, but it wasn’t stunning. I don’t think it is the best chicken rice I’ve ever had. But I like the feeling of eating in a hole-in-a-wall place; sharing a table with strangers and eating with your elbows tucked to prevent knocking into someone. 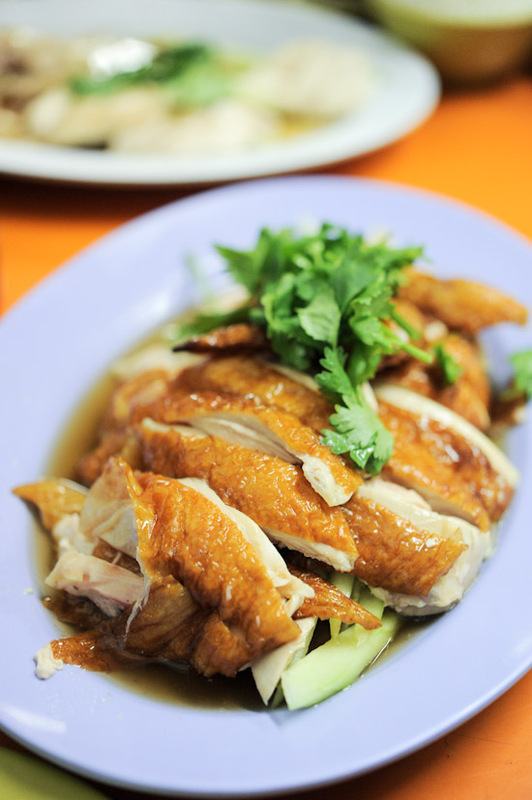 Moreover, Hainanese Delicacy Chicken Rice is conveniently located in town; it is a good place to go if you want a reasonably-priced and fuss-free lunch. Where do you eat when you are meeting your friends in Orchard Road? I loved the chicken rice here! Theres a place in Singapore that sells chicken rice ball. Previously it was at Jalan Besar, and now is at Toa Payoh. I wouldn’t say is the best, but it feels like homemade chicken rice in overall. The address is Blk 111 Toa Payoh Lor 1 coffee shop. Not very sure of the name of it. This place used to be my favourite Chicken Rice until I stumbled across the Chicken Rice in the basement of Lucky Plaza. Fantastic and on Orchard road. I’ve been a loyal patron of this chicken rice stall for the past 8 years. I like this place for the extra effort made to keep the chicken meat less oily and the hard boiled egg is very good. Take a closer look next time when you eat there, you would notice that the fats has been removed from the chicken skin, something which probably this is the only place that does it this way. I supposed to people who are used to fatty looking chicken meat, this is not the place for them. I would give this place a 4.8/5 as it is my type of chicken rice. Recently I had try the chicken rice at Hougang Green Mall. The name is ??????? (Bliss Chicken). Apparently the uncle inside the stall has more than 35 year experiences (I read it from their newspaper articles). The chicken rice is fragrant and not too oily, the chili is traditional Hainanese paste (made of 100% chili padi), the steamed and roasted chicken are tender and delicious (even the breast meat is also juicy). I saw their name card that they are serving different types of soup daily for free. It’s really worth trying overall. Try the steamed chicken next time instead of the roasted chicken. I guarantee you will see what the fuss is about. Poor attitude and lousy service of staff. Food only so so.